There is hope for a brighter tomorrowNothing can destroy your world like losing a child. It is devastating on a level that most people can't imagine. Once you have experienced such a tragedy, you may feel that you will never again be able to live with peace and joy.Written after the death of the author's own child, Surviving the Loss of a Child offers you compassionate encouragement born from deep sorrow. You will find no pat answers or patronizing panaceas here--just real words of healing from someone who has been exactly where you are now. Hurting parents will find this book a source of comfort, while concerned friends, counselors, pastors, and caregivers will find it a perfect gift for the bereaved. Its short chapters and proven coping mechanisms are easy to take in.There is life after death--even the death of a beloved child. Discover how you can go on living and reclaim hope in your heart.Elizabeth B. Brown is a teacher, a speaker, and the author of the popular Living Successfully with Screwed-Up People. Besides going through the loss of her own child, Brown has done extensive research on grief, and she and her pastor husband give grief seminars around the country. - Publisher Nothing can steal peace and joy and undermine the very foundation of someone's life like losing a child. It is devastating on a level that most of us can't imagine. 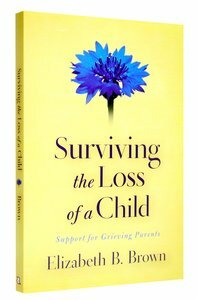 Written after the loss of the author's own child, Surviving the Loss of a Child offers encouragement and hope to those who may think they will never be able to live fully after such tragedy. Bereaved parents, as well as friends, counselors, pastors, and caregivers, will find this book a source of comfort and discover coping mechanisms as they move through their grief. Revised and updated, it has short chapters that are easy to take in, perfect for people going through this difficult time. About "Surviving the Loss of a Child: Support For Grieving Parents"
Nothing can steal peace and joy and undermine the very foundation of someone's life like losing a child. It is devastating on a level that most of us can't imagine. Written after the loss of the author's own child, Surviving the Loss of a Child offers encouragement and hope to those who may think they will never be able to live fully after such tragedy. Bereaved parents, as well as friends, counselors, pastors, and caregivers, will find this book a source of comfort and discover coping mechanisms as they move through their grief. Revised and updated, it has short chapters that are easy to take in, perfect for people going through this difficult time.